Participants listen to Dr Raoul-Gabriel Urma of Cambridge Spark. Dr Raoul-Gabriel Urma (first row, fourth from left) and Associate Professor Dr Bakri Madon (first row, third from right) with the participants. 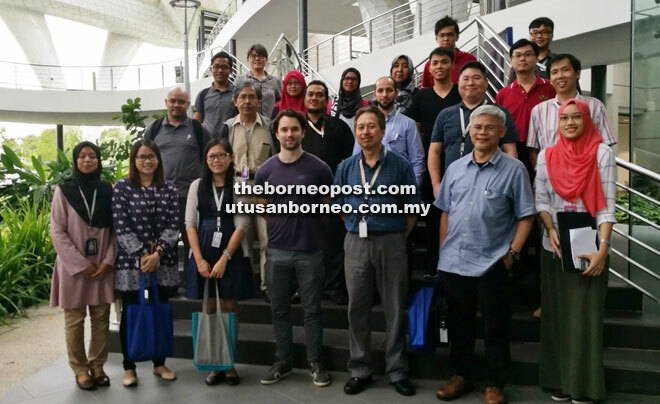 SIBU: The School of Computing of the University College of Technology Sarawak (UCTS) recently conducted a Big Data Analytics Workshop in collaboration with Cambridge Spark, a leading learning community for data scientists and developers based in Cambridge, the United Kingdom. It was co-organised and co-sponsored by EJJV Venture Sdn Bhd, a local IT company, according to a press statement released by UCTS here yesterday. Associate Professor Dr Bakri Madon, the Dean of School of Computing, hoped the event could be the catalyst to develop a local community of data scientists to spur research in emerging fields such as smart city, precision agriculture and healthcare, as well as to meet the talent needs of the Sarawak Digital Economy initiative. He anticipated a research collaboration between UCTS and Cambridge Spark in the area of Learning Analytics, a project to enhance teaching and learning experience at UCTS. The one-day event attracted participants from UCTS, Kolej Laila Taib, Politeknik Mukah and Sacofa Sdn Bhd. “The main objective of the workshop was to introduce and expose the trainees to the technical fundamentals and market challenges of the Big Data ecosystem. “Through practical hands-on exercises, participants applied Hadoop and Apache Spark software development tools on a range of real-world datasets to process and analyse data at scale. They were also given the opportunity to leverage cloud technologies such as Amazon EMR to process large datasets,” it stated. The instructor of the workshop, Dr Raoul-Gabriel Urma, is also the CEO and co-founder of Cambridge Spark. He is also the chairman and co-founder of Cambridge Coding Academy, a growing community of young coders and pre-university students in Cambridge.